Makayla with Nickelodeon's Jack Griffo. Makayla took plenty of photos and got a special T-shirt signed by the entire cast to take home. She can’t wait until the movie is complete so she can see the final product. 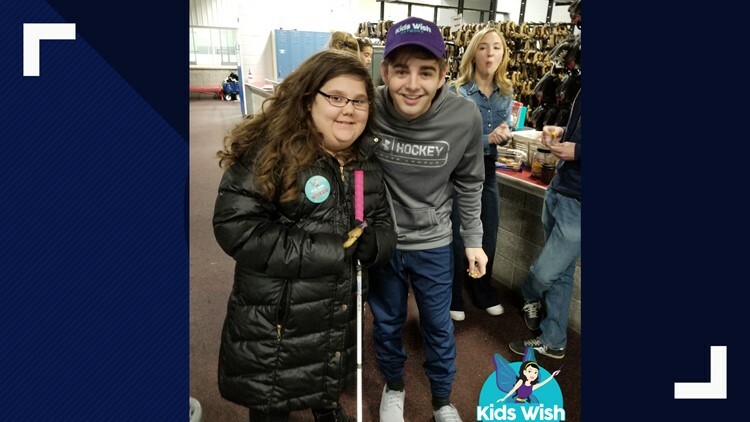 Makayla Mertz and her mom were flown to Rochester New York to meet her favorite celebrity Jack Griffo, the co-star of the hit Nickelodeon TV show The Thundermans. It was Makayla’s first time flying and she was in awe the moment the plane left the ground. Kids Wish Network, a children’s charity that grants wishes for kids with life-threatening illnesses, flew Makayla and her mom to New York, where they stayed at the luxurious Genesse Grand Hotel. On the day of her wish, Makayla and her mom were chauffeured to the set of Sid is Dead, the new movie Jack Griffo is filming. As soon as Makayla arrived, she began to cry tears of joy. “My favorite part was seeing Makayla’s initial reaction,” said Makayla’s mom Candace. Once on set Makayla met all the stars of the movie, and spent time with Jack Griffo, Joey Bragg, Audrey Whitby, and Genevieve Hannelius. Makayla was welcomed by the cast who made her feel completely at ease. Makayla talked with them for hours about the movie and their lives as actors. Makayla suffers from retinitis pigmentosa and Bardet-Biedl syndrome. Because of her conditions, Makayla is completely night and color blind and lacks peripheral vision. Makayla’s conditions also cause her to gain weight and impedes her speaking ability. Makayla loved her wish and enjoyed every second she spent with Jack Griffo and the rest of the crew. She received a signed letter from her idol, thanking her for coming and telling her how much he enjoyed spending time with her and told her that she should be the best that she can be. Makayla took plenty of photos and got a special T-shirt signed by the entire cast to take home. She can’t wait until the movie is complete so she can see the final product. After her amazing day with Jack Griffo, Makayla and her mom had a delicious meal at The Cheesecake Factory. “We are incredibly grateful to Jack Griffo and all the actors and crew that made Makayla’s wish so amazing,” said Kids Wish Network Executive Director Tam Lai.